Ryan Betts, Cloud Solutions Architect: Certificate Services New Cert Req from CSR fails with "The request contains no certificate template information 0x80094801 CERTSRV_E_NO_CERT_TYPE Denied by Policy Module 0x80094801 The request does not contain a certificate template extension or the Certificate Template request attribute." 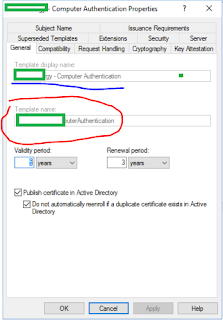 Certificate Services New Cert Req from CSR fails with "The request contains no certificate template information 0x80094801 CERTSRV_E_NO_CERT_TYPE Denied by Policy Module 0x80094801 The request does not contain a certificate template extension or the Certificate Template request attribute." "The request contains no certificate template information 0x80094801 CERTSRV_E_NO_CERT_TYPE Denied by Policy Module 0x80094801 The request does not contain a certificate template extension or the Certificate Template request attribute." This was when the "Request new CA certificate" option was used from the Certificate Authority GUI. To use the command line tools to generate this certificate you must find the true certificate template name, please note that this is not the template name which is displayed in the Certificate Templates pane. 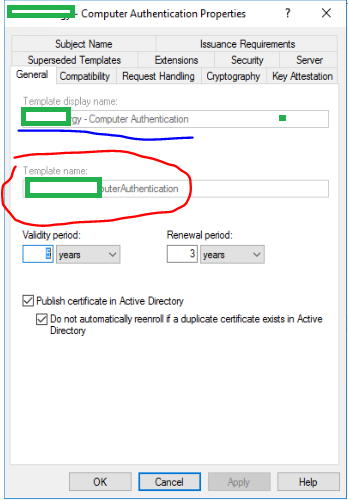 To find the true name right click Certificate Templates and select Manage, find your template from the list and select Properties. Once you do this it will ask you to confirm which AD CS in the AD you want to issue the certificate, in my example there is only one.